"Soldiering is easy, Jean-Louis. You see, we just follow these big red arrows..."
When we last left the village of Boom, its defenders (The 23rd Royal 'Welch' Fusiliers) were girding their loins, preparing to be attacked by three battalions of French infantry, supported with all the possible trimmings (a frothing Marshal Ney, two generals of brigade, three battalion commanders, two pioneer companies and Yvette from the Divisional Brothel). After the charges had been declared the attackers next needed to determine if their resolve would hold in order to allow them to follow through with the charge. The two battalions from Sylvain's brigade passed with aplomb, their drummers taking up the 'pas de charge' and his columns moving forward at the quick step. My lone battalion, on the other hand, completely sh*t the bed and sat around like a bunch of striking Parisian transit workers, smoking Gitanes and reading 'LeMond'. As you can imagine I was not impressed. Anyway, the Brits, watching the French come up held their bottle and let them have a dose of musketry and canister at close range. The French took the casualties, gritted their teeth and stormed the village. 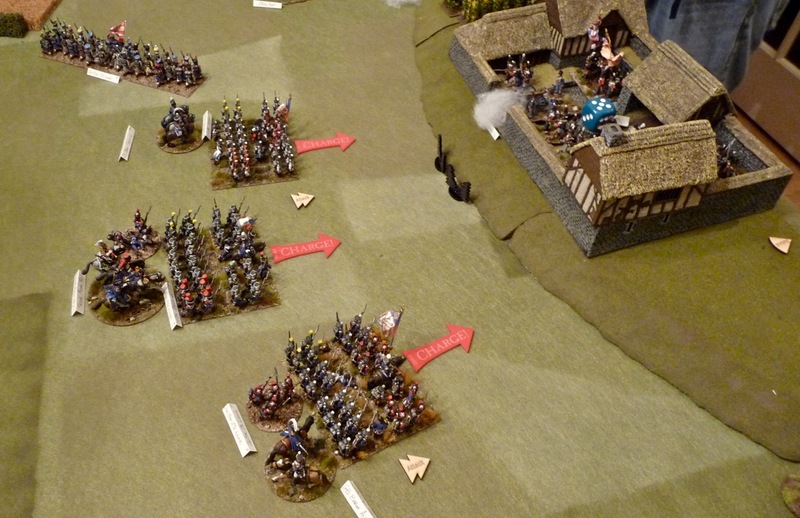 The ensuing first round of combat was a pitched battle with handfuls of dice being thrown. The British had the advantage of defending the village but they knew that they could not trade casualties with the more numerous French. The dice did not come through to give the British the definitive victory and so the result was a draw. Casualties were suffered on both sides and a second bound was set to be fought. The French immediately storm Boom again with the two battalions that they have at hand. The combat in the streets is furious but the British get the definitive upper hand and Ney is forced out of the village. 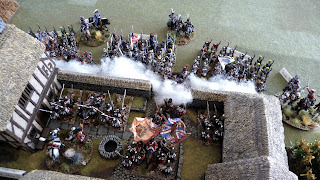 A bird's eye view of the second assault. 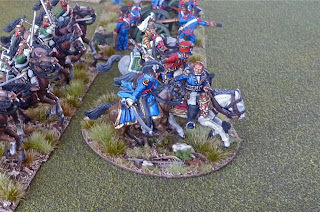 The French spend time to regroup and bring up a third battalion with its assault pioneers to add weight to the assault. Charge checks are passed and Ney goes in again! Over the next two bounds, the increase in French numbers and the incessant whittling down of the British garrison begins to tell. Finally the defense, harried beyond measure, entirely collapses under the weight of the assault. Ironically, in the final turn Ney is killed in the last spasms of vicious street fighting. 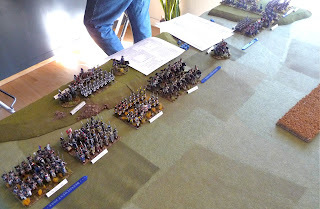 The victory points are tallied and it is determined that while Louis and his royal court has escaped, a significant number of British are still trapped on the wrong side of the River Rupel. It is a hard won French victory and Ney can rest assured that his death will be remembered as a glorious one! 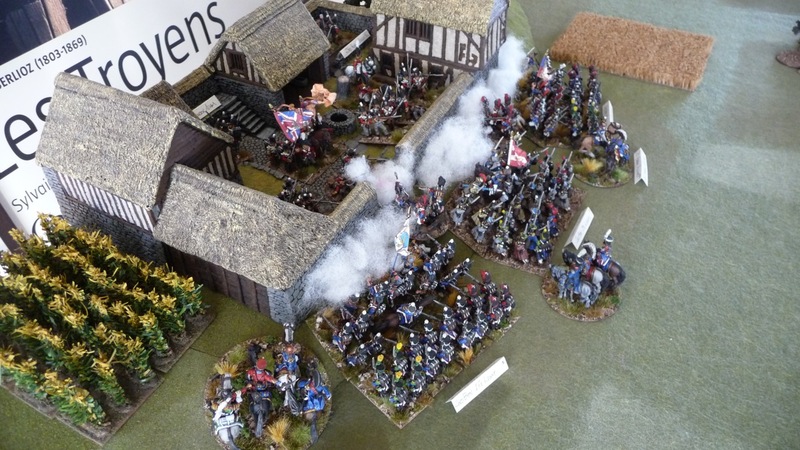 As a footnote, we played this scenario once again using a modified version of Black Powder. The big difference in this replay is that the British were provided with a small detachment (two squadrons) of KGL Light Dragoons which created havoc with the French advance, ultimately destroying an artillery battery before they were brought to ground by a regiment of Dragoons. Nevertheless, the French finally forced their way past the British defense screen and began their assault Boom en force. The French enter the Belgian flood plain on their approach to Boom. 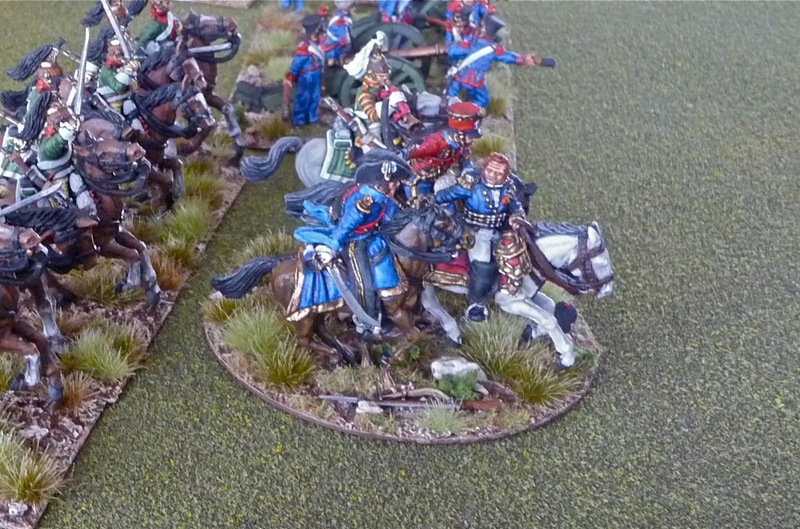 KGL Light Dragoons crest a hill and charge a battery of French artillery - and survive! The Rifles hunker behind a stone wall and harass the French with long-range fire. 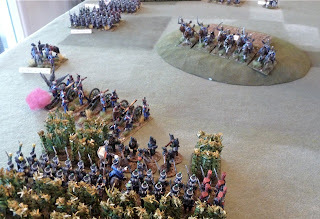 To make a long story short, the assault lasted for four turns, but the telling lack of a preparatory artillery bombardment and the stalwart British defense in the plain, had a significant impact on the final assault. 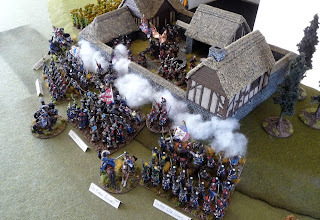 Though the combat was protracted and bloody the British held long enough for the army to evacuate (along with Louis' royal court) and the guts were finally ripped out of the French assault with Ney and the survivors being thrown back. As a twist of fate, it is the British commander, Frederickson, who is killed in the last turn - right at the point of his victory. How apropos considering the result of the last scenario! Following are a few shots of the assault. Thanks to all the guys that came out to make these games such great fun - I look forward to our next bash! Sounds a great game, the photo's are excellant too!! Cheers Ray! Yes, the guys really took the scenario by the bit and fought it out to the bitter end which makes for a fun time. Absolutely! Austrian White will be a welcome change from the normal British Red. Ace looking figures and terrain.